Lauren joined the Campus Estates team in September 2012 as a Registered Veterinary Technician. She has a special interest in critical care and emergency medicine. Prior to starting at Campus Estates, Lauren graduated from the University of Guelph with a Bachelor of Arts degree. Her love for animals then guided her to the Veterinary Technician program at Seneca College where she graduated with honours in 2012 and passed her registration exam the same year. 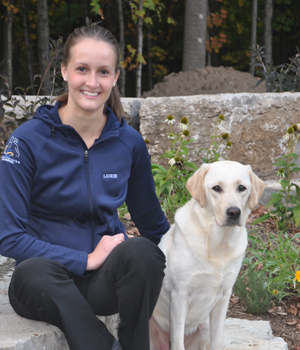 When she’s not at the clinic she enjoys playing competitive indoor and beach volleyball and volunteers with the Lions Foundation of Canada Dog Guide program, raising future service dogs.